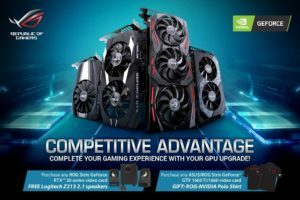 ASUS Republic of Gamers (ROG) and NVIDIA has announced the Competitive Advantage promotion. With this offering, gamers looking to upgrade to ASUS or ROG GeForce graphics card products get special freebies and giveaways. Running from March 30 to April 28, 2019, the Competitive Advantage promo gives users with either a free Logitech speakers or an ROG polo shirt for their every purchase of any of the latest ASUS and ROG Nvidia graphics cards. Those who will purchase an ASUS or ROG GeForce RTX 2080 Ti, 2080, 2070, or 2060 graphics card will get a free Logitech Z213 2.1 speakers. To claim, shoppers must register their graphics card using an ASUS account. They also need to fill out the needed purchase and delivery details on this link. Meanwhile, gamers get a premium polo shirt for every purchase of ASUS or ROG GeForce GTX 1660 Ti or 1660. The item is already bundled with the product upon purchase and does not need to be claimed online. All ASUS and ROG GeForce RTX 2000 and GeForce RTX 1660 series graphics cards are available nationwide through its partner resellers. Below is the suggested retail price list for the participating models.